Sam Shropshire prepares a backhand. The junior will look to help the Cats capture the Big Ten title in the postseason after previously falling a win short. Tuesday was hardly an ideal day for outdoor tennis. With high winds and temperatures under 50 degrees, the Wildcats probably would have preferred to practice indoors. But given the potential for outdoor competition in the weekend’s Big Ten Tournament, coach Arvid Swan ensured that his team is prepared for potentially adverse conditions. 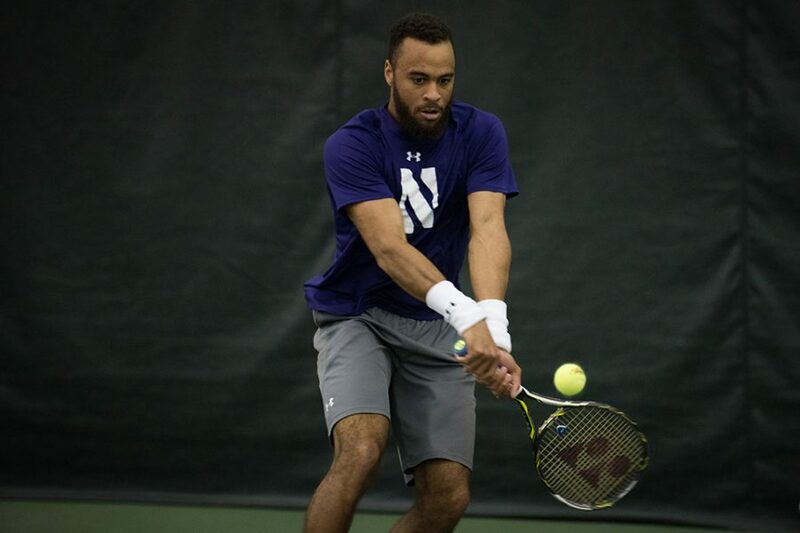 Tournament host Minnesota has yet to announce whether play will take place indoors or outdoors, but after falling a win shy of the regular-season Big Ten title, Northwestern (24-3, 10-1 Big Ten) is readying itself for any and all roadblocks in the postseason. Before looking ahead to other obstacles — such as a meeting with top-seed Ohio State in the championship or a semifinal contest against Illinois, with whom the No. 2-seeded Cats split their regular-season contests — NU is focused on its first matchup of the tournament, which will occur Friday against either No. 7 Purdue or No. 10 Minnesota. Despite a first-round bye and heavy favorite status in that quarterfinal contest, the Cats maintain that both potential opponents deserve respect. NU beat the Golden Gophers 4-0 when they faced off in early April. Purdue, however, was among the few teams not to be shut out by the Cats during conference play. Junior Konrad Zieba lost at first singles and senior Fedor Baev fell on court No. 4 when the teams last played in late March. “If we’ve learned one thing this season (it’s that) every Big Ten match is going to be extremely hard,” Shropshire said. Zieba said regular-season experience against upcoming opponents will help him make improvements, a sentiment echoed by both Shropshire and Swan. However, all three also noted that added experience plays both ways. If the Cats win their opening contest, they’ll draw on Saturday either Illinois or the winner of the Penn State and Michigan State match. Though Illinois is the tournament’s No. 3 seed, it could potentially have its hands full with the Nittany Lions, who previously handed the Fighting Illini a loss. The Cats will only have the opportunity to avenge their loss against the Buckeyes if both teams qualify for the finals, which will be played Sunday. Despite the stakes, the team is more focused on winning than any individual opponent. And after a season that saw the Cats break the program’s record for most wins in a season, a championship would solidify them as national contenders heading into the NCAA Tournament. As Swan continues to grow the program, such recognition would be an impressive milestone.